Invasive species threaten the biodiversity of aquatic ecosystems worldwide and are considered the second greatest threat to biodiversity loss in North America. In North America, freshwater fish are likely the most threatened group of vertebrates other than amphibians. A review of the literature by Miller et al. (1989) found that exotic species introductions (illegal and intentional) were a factor in 68% of fish extinctions in North America, and the rates of introductions have increased dramatically in the last 50 years impacting nearly every major watershed in the United States. Predation, competition for food and habitat, food web alterations, interbreeding, disease and transmission of parasites are some of the major problems with non-native fish species. Habitat loss and degradation, climate change and urbanization have contributed to the establishment and spread of non-native fish. Fisheries management programs have transplanted popular sportfish, such as northern pike brown trout, brook trout, rainbow trout and lake trout to provide recreational opportunities and many other aquatic organisms have been planted to enhance fish growth (e.g., opossum shrimp). Additionally, international commerce has facilitated the movement of species via ballast water in ships (e.g., zebra mussel), aquarium releases, and illegal translocations. Regardless of the cause of species introductions, the establishment and proliferation of invasive species often results in the decline and potential extinction of native species, with invasive predators having the most dramatic effects. 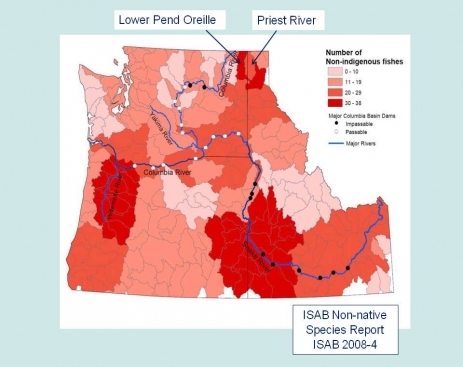 Non-native fish management approaches vary according to location in the basin. Please view the links below for more information on non-native fish management in tributaries, lakes, rivers and reservoirs.